An Afghan air carrier Ariana flies to Kabul from many cities in the world, although the only European destinations are Frankfurt in Germany and Moscow in Russia, and the rest is in Asia and Middle East. The tickets are not that expensive. The disadvantage of this approach is that you immediately end up in Afghanistan — perhaps, you can avoid culture shock by coming overland from Pakistan. On the other hand, getting that shock is an interesting and worthy thing by itself. So, it is up to you. Remember though that when the government needs a plane for an official visit, it borrows one from Ariana, canceling a scheduled flight. And on some routes planes do not fly if there are not enough passengers. If you are hard pressed for time, it is faster to fly to Pakistan and get to Afghanistan from there by land and then make this trip in the opposite direction and fly home from Pakistan. While Afghanistan does have a land border with China, you can not cross there — there is no crossing point, and you simply can not get there physically. You can get by land to or from Tajikistan and Turkmenistan, but tourists are not allowed through the Uzbekistan border. If you plan to come to or from Central Asia, first make sure you understand what those countries are these days. There is one crossing point on the border with Iran, in Islam Qala. From Mashhad it takes four hours to get there by bus. In a taxi it is about three hours and 20 dollars, but a bus is much cheaper. On the Afghan side there are minibuses to Herat, three hours, one dollar. And on that side there is no customs. In general, the Afghan sides of all border crossings have no barbed wire, no guards, nobody stops you. To avoid entering the country illegally, walk slowly with the passport in your hand and an unsure expression on your face. Somebody will point you to a cabin with immigration control. You need an entry stamp in the passport. There are two crossing points with Pakistan. Torkham is on the Peshawar–Jalalabad route, and Spin Boldak or Chaman is on the Quetta–Kandahar route. The first one is more convenient in many aspects and is also safer on the Pakistani side. It takes you two hours to get to the border from Peshawar, but the road goes through the so-called Tribal Areas, which are not controlled by the Pakistani government. You have to get a free permit to pick up a free machine gunner and to proceed to the border — more about this in the Peshawar section later. A taxi to the border is about 15 dollars. At this border crossing there is no customs on any side, only immigration control. 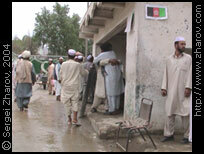 On the Pakistani side you get a departure stamp and walk on foot to Afghanistan, which is within 50 meters from there. Then you get the arrival stamp and catch a taxi or a minibus to Jalalabad. You will be there in two hours and three dollars. As for Spin Boldak, you need three hours on both sides on the border — from Quetta and then to Kandahar. On the Pakistani side the village is called Chaman. You also need a permit and a guard here, as there is a risk of an armed robbery. Should you decide to fly to Afghanistan anyway, here is the schedule of Ariana. The prices are for the economy class, one way and round trip. Exact figures change periodically, of course, so check their web-site or call their agent. In the US their toll-free number is +1-866-330-3431, and it works for Canada, too. In UK it is +44-20-8843-0011. Like the Afghan embassies, Ariana has not answered my e-mails either. This company mostly services internal routes but also flies to Dubai and, possibly, Istanbul. Check their site for details or call their offices in Kabul (+93-20-2200108, -70-230755, -70-222204), Herat (+93-40-228951, -70-404964), Dubai (+971-4-3520200), Istanbul (+90-212-6633718), and toll-free in the US and Canada (+1-888-952-6247).